Not all fats are created equal: good fats we must have to maintain health, and bad fats rob us of it. A few of them are in between, or nearly neutral health-wise. Some of the good fats your body doesn't need to get from food (since it can make them), but consuming them won't hurt you unless taken in excess. Those that it can't make are called essential, and can only be obtained from food, or food supplements, preformed. For most of us, the main role of fats in the diet is to make meals yummy and satiating. And, to a smaller extent, to store some energy and form a worm, insulating layer under the skin, just in case it gets cold. Health connection - well, maybe... For this, or some other reason, the role of fats in general, and essential fatty acids in particular, hasn't been investigated as much as for most other essential nutrients (minerals, vitamins, amino acids). very much depends on the amount and kind of fats we consume. It is quite simple when it comes to the amount of dietary fats that we need. According to the government, it is in the 20-35% of total food calories range. That, however, needs to be taken with the grain of salt (meat and dairy industry does have lots of money and influence). Most nutritionists agree that fat calories shouldn't make more than 25%, or so, of the average diet, with about 1/3 of it being essential fatty acids. What is it that makes different kind of dietary fats good, insignificant, or bad? It has to do with their molecular structure, which determines how they "behave" in the body. Dietary fats belong to the broad group of organic compounds called lipids. They include fats, oils waxes, sterols, triglycerides, phosphatides and phospholipids. They are structural and/or functional component of living cells. Most dietary fats - about 95% - as well as most of the stored fats in the human body, are a sub-group of lipids called triglycerides. They consist of three fatty acid molecules attached to a single glycerol molecule. In the body, broken down and partly re-synthesized before they reach their final destination - individual cells - they are used as a source of energy, for nutrient transport (as a component of transporting "vehicles" called lipoproteins), and cellular membrane functions. The fat that body stores due to excessive caloric intake (primarily that of fats and carbohydrates, which are both metabolized by cells to acetyl CoA, precursor for fatty acid synthesis), triacylglycerol, is also a triglyceride form. TRIGLYCERIDES: The most common form of dietary fats, formed from glycerol - an alcohol, since containing carbon bound to hydroxyl (OH) group - and three fatty acids, by enzymatic actions removing hydroxyl group of the fatty acid and hydrogen from one of glycerol's hydroxyl groups. This results in a single bond forming between α-carbon (the carboxyl group's carbon atom) of the fatty acid and the oxygen molecule of the glycerol (note how the presence of double bond in the carbon chain changes its molecular structure from nearly straight - characteristic of saturated fatty acids - to one that is bent at the double bond location. (3) carbon chain, linking the two. 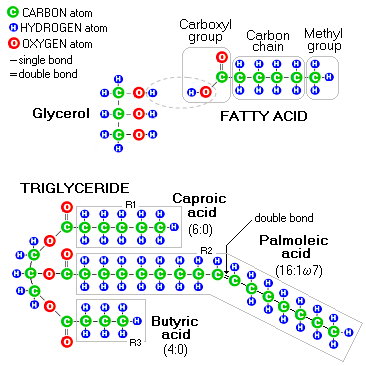 The methyl group and carbon chain form a portion that is fat soluble, hence the name "fatty acid". Fatty acids with no double carbon-to-carbon bonds in their carbon chain bond the maximum possible number of hydrogen atoms, thus are called (hydrogen) saturated. Those with one or more double carbon-to-carbon bonds have less than maximum possible number of hydrogen atoms in their molecule, and are called unsaturated. The methyl group of a fatty acid is called omega end, since it is formed around carbon atom farthest from the alpha carbon (one that carries the carboxyl group). That is where the omega fatty acids name for unsaturated fats comes from, since the position of their double bond (or bonds) is determined by the numerical order of the double-bond carbon atoms beginning from fatty acid's omega end. For instance, the palmoleic acid above is an Omega-7 fatty acid, since its double bond is at the 7th carbon atom from the omega end (the alternative system is based on fatty acid's carboxyl group, which forms fatty acid's delta end; thus this same fatty acid would be designated as Delta-9). Dietary fats also include phospholipids, like choline from lecithin, which in addition to fatty acids contain phosphate group. Phospholipids are vital for cellular metabolism, cellular membrane function and - as lipoproteins component - transport of fats, cholesterol and fat-soluble vitamins (A, carotene, D, E and K). Fats are harder to burn than carbohydrates; normally, less than half as much fats as carbohydrates are burned for energy (by weight). Being hydrophobic, fats are easier to store, and body prefers storing them into fat cell tissues as a spare source of energy (which also functions as a thermally insulating layer). Every gram of fat burned for energy releases 9 calories. That helps you determine your total daily fat intake. The government sets it at 20%-35% of the total calories consumed (6%-11% of the total for the essential fatty acids). Most competent sources see the optimum fat intake somewhat lower, in the 15%-25% range, about 1/3 of it being the essential fatty acids. Similarly to proteins, most of fatty acids needed for health can be synthesized by the body. That includes saturated fatty acids and most unsaturated fatty acids (the term comes from the degree of their saturation with hydrogen atoms). The two unsaturated fatty acid forms that the body cannot synthesize - Omega-3 and Omega-6 - are called essential fatty acids. We need to obtain them preformed from the food we eat. Both, saturated and unsaturated natural fats are needed and used by the body. It is only in excess when they become unhealthy. However, exposing fats to high temperatures can change their chemical structure and make them inherently - and very much so - unhealthy. Among the most damaging by-products of exposing fats to high temperatures are trans-fatty acids, the mutant molecules transformed by heat into random intermediate forms between unsaturated and saturated. Technically, most trans-fatty acids are still unsaturated, either poly- or super-unsaturated, but with twisted internal molecular structure. Most of them are, actually, the only unconditionally bad fats, being destructive to the body even in very low concentrations. Their similar molecular form enables them to sneak into place of regular essential fatty acids in the cellular membrane, but due to different internal structure they do not function properly, causing damage at the cellular level. Most sensitive to trans-fatty degradation from high temperatures are super-unsaturated and polyunsaturated fatty acids. This is why natural oils high in these fatty acids (flax, hemp) should never be heated. It not only destroys good, healthy fats, it makes them transform into bad fats. Monounsaturated fatty acids, such are those making most of olive oil (76%), are more resistant to trans-fatty acid formation, hence can tolerate limited heat exposure - such as that from most forms of cooking - without becoming unhealthy. Still, the safest fats for cooking and frying are saturated fats, like butter and unprocessed tropical oils (coconut, palm, palm kernel, shea nut). However, their intake should be limited, as already mentioned. Canola oil is high in more stable monounsaturated fatty acids (54%), but also contains significant portion of unstable poly-unsaturated Omega-6 (30%) and super-unsaturated Omega-3 (7%), when in its natural state. Since these essential fats - especially the Omega-3 - spoil easily, canola oil is most often "refined", in order to destroy unstable fatty acids (exactly the ones we need the most). This also may produce some trans-fatty acids, and more is added if the oil is exposed to high heat during food preparation. Unlike proteins and carbohydrates, fats are easily and significantly degraded during typical processing routines. That makes them unhealthy in various ways and degrees. Processing cannot be strictly controlled in a sense that the final chemical structure of processed oils varies unpredictably. Here's a glance of the terms used for commercial oils and their meaning. ◊ "unrefined oil" is not necessarily natural, nor cold-pressed, even if it is labeled as such; it is the oil after its basic production phase, i.e. either expeller pressed or solvent extracted; if it is expeller pressed, it is first cooked at about 120°C, and then pressed at somewhat lower temperature; the process causes loss of nutrients, some damage to polyunsaturated fatty acids (partial transformation to conjugated fatty acids), and most often - whenever heated oil is not sealed off from air - induces some level of rancidity. Solvent extracted oils are also heated to 150°C and, in addition, may contain toxic solvent residues. ◊ "refined oil" may have been through any or all of several processing options after the basic production phase; in the process, oil is nearly entirely cleansed from nutrients, contaminated with chemical residues and usually deodorized, at ~150°C, which partly turns polyunsaturated oils into trans-fatty acids. Also, these temperatures are high enough to make some polyunsaturated fat molecules mutagenic5. These unnatural, unhealthy oils also rob the body of nutrients, since don't contribute any, but do require them to be metabolized. Most supermarket "refined oils" are of this kind.